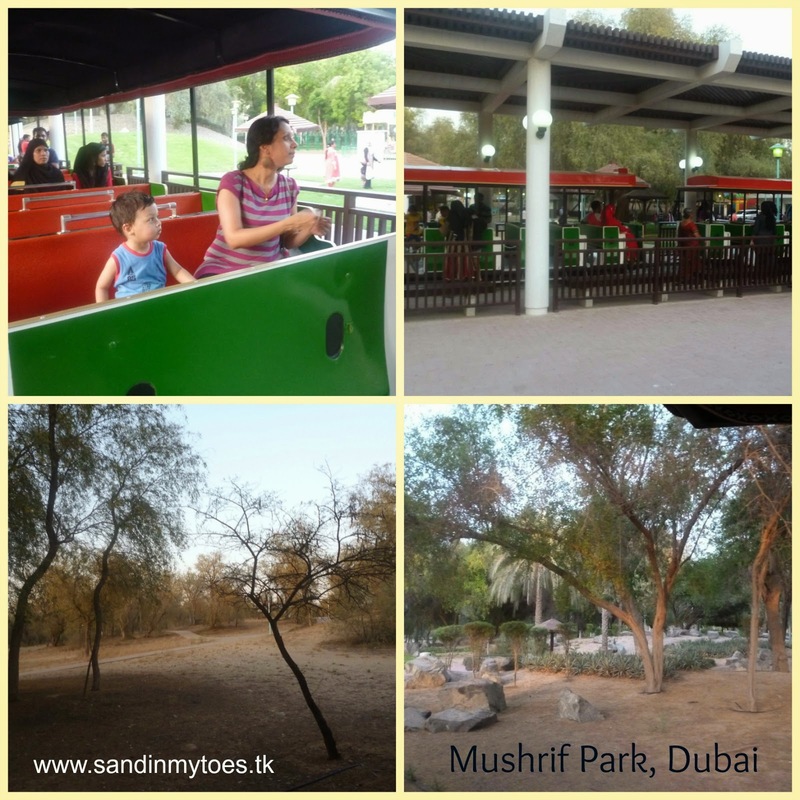 Ever since we moved to Dubai, I have been pestering my husband to go to Mushrif Park. This park has a special place in my heart because I remember the many times I visited it on school picnics. I really wanted to revisit some of my childhood memories, and also wanted Little Dude to experience them with me. 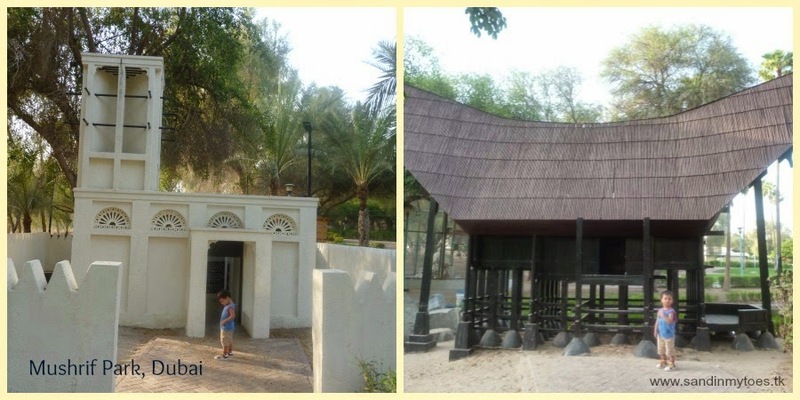 Now, the main attraction of Mushrif Park is something called the World Village, which is what I had the most vivid memory of from my school days. It's a collection of little houses from different parts of the world. They are big enough for both children and adults to go in. My favourite one is the Japanese house in the lake! There's also a Dutch windmill house, and a Nordic house pictured below. Of course, Little Dude and I had fun going in and out of the houses, and his Dad joined in too! Even though it was a hot day, this was certainly an exciting place for Little Dude. I was a little disappointed, though, that the houses have not been maintained very well and some even had trash in them. This is a little sad because nothing of this sort exists in Dubai, and I'm sure children will love this place if it is properly maintained. Another attraction of this park is the train ride which covers almost the entire park, something which you can't really do on foot. We took this lovely train ride (a steal at AED 2!) at around sunset and it was just beautiful. We saw some of the most natural areas of the park. 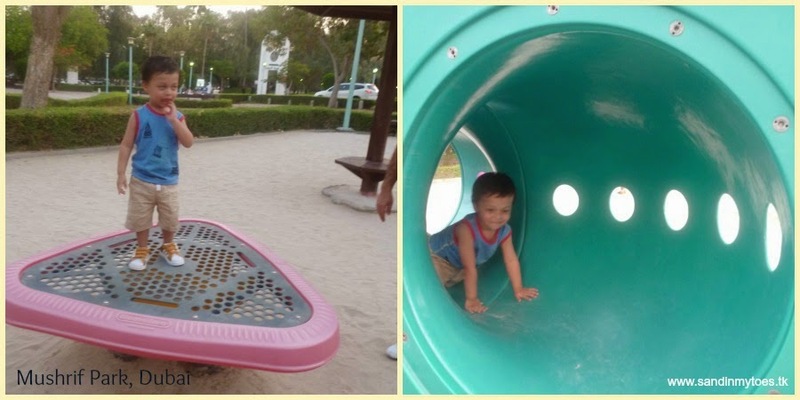 Despite being tired, Little Dude still wanted to go to the playground, and there are many at Mushrif Park. The play structures are really big here, and older kids can keep busy here for quite a while. Little Dude was particularly interested in the trampoline and the tunnel! If you're a natural lover, this is a park you must visit in the UAE. It's a peaceful place and great to just laze around and take in the sights. There must be many birds here, because the twittering was constant and loud! But it has also become a flight path and there many planes taking off just overhead. But we loved it all the same, and will definitely be planning a day long picnic (they also have barbecue stations) when the weather gets cooler. Great place and wonderful for kids imaginations, such a shame about the rubbish insode though, that would really spoil it for me. We have something similar here that I blogged for Country Kids a few months ago, the children really loved it there. Yes, that's why I loved going back again! Yes, I wish it was better maintained. I must check out your post too! It was really a good feeling, Merlinda! It was fun, although a little hot! That's why I plan to return in winter. It was great returning to a place I remember from those days! Looks like an amazing park! You certainly had a wonderful time there. Great to have found you on #myexpatfamily. Yes we did! Thanks for stopping by.